BPR INC IS THE LEADER IN TRIP HAZARD REPAIR! OUR METHOD IS FASTER, CLEANER AND GREENER! The Problem: Uneven sidewalks detract from the aesthetics of a neighborhood but more importantly they are dangerous to pedestrians! Not to mention the potential for costly trip hazard liability lawsuits! 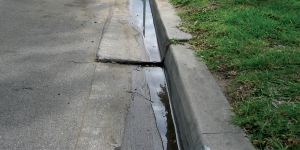 The Problem: Standing water in the gutter can become a breeding ground for disease carrying mosquitoes. Have you heard of West Nile Virus? 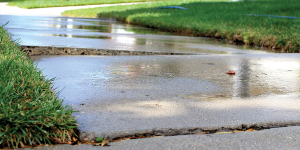 This nuisance water also prematurely deteriorates the street and cases a safety hazard. Copyright BPR, Inc. 2015. All rights reserved. Site designed by Consortium Media Services.